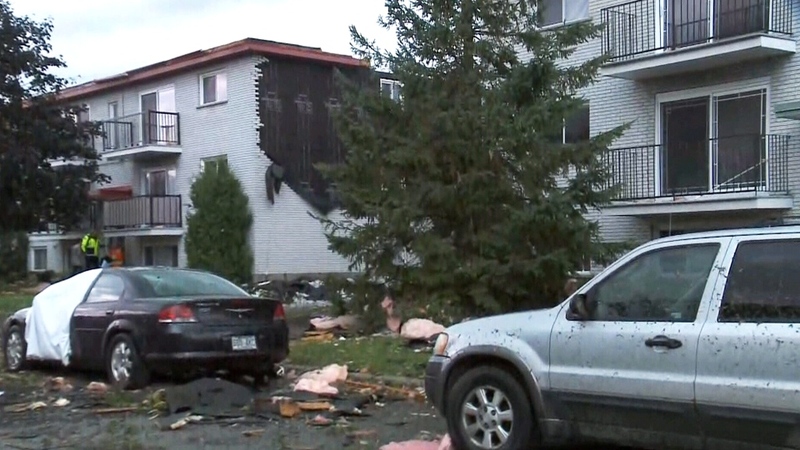 A tornado damaged buildings and flipped over cars as it tore its way through the Ottawa area to Gatineau on Friday. Anthony Di Monte, chief of Ottawa Emergency and Protective Services, told CTV News that there are currently 30 known injuries across the city with five people in Dunrobin suffering critical injuries. The Ottawa Hospital said late Friday night it had received six patients, two of them in critical condition. Videos and images on social media showed toppled trees, roofs ripped apart and streets littered with debris. One video posted to Twitter showed people rescuing a Beagle that had been trapped under rubble. A spokesperson for Environment and Climate Change Canada told CTVNews.ca that the tornado first touched down near Dunrobin, Ont., causing "pretty significant" damage before heading across the Ottawa River. 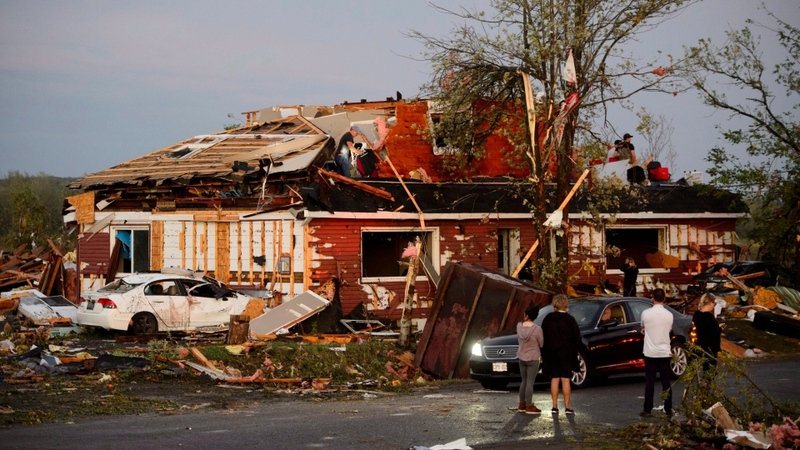 The City of Ottawa tweeted to confirm two locations of suspected tornado damage, with emergency staff responding to the Dunrobin and Hunt Club/Greenbank Road areas. "The devastation is unreal," said witness Matthew Bowen. He said that approximately 10 houses and an entire mini mall in the area near his family's restaurant in Dunrobin were destroyed. The tornado made it as far as Highway 50 near Gatineau -- nearly 40 km away -- overturning several cars along the way. Environment Canada has dispatched teams from Montreal to survey the damage, and will send teams to the Ottawa area tomorrow to try and determine the strength of the storm. 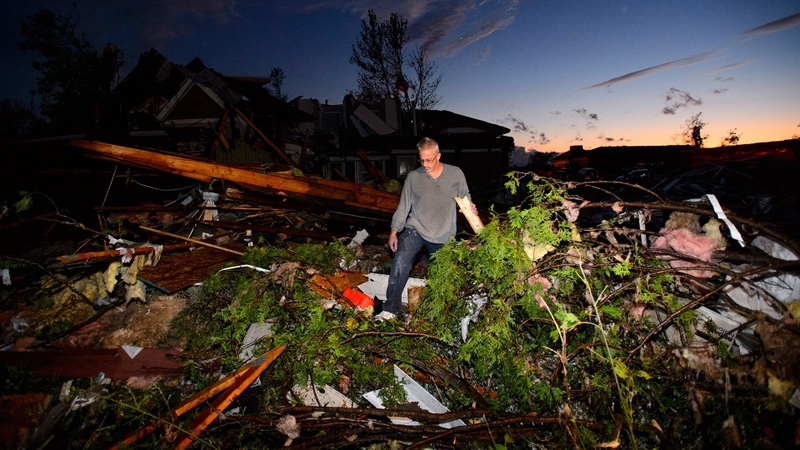 Early estimates suggest that the tornado will be classified as an EF-2, with winds topping more than 200 km/h. “The probability of being affected by a tornado is very, very small. And even if you look at Ottawa, the coverage of this particular tornadic storm was actually quite small. But for the people affected, it’s devastating,” said Peter Kimbell, a meteorologist with the agency. “I only have a day like this a couple times in my career. So yeah, it’s pretty remarkable,” said Kimbell. Environment Canada measures the intensity of wind damage using something called the Enhanced Fujita Scale, or EF-Scale. This six-point scale ranks events such as tornadoes from zero to five, with the latter being the most severe category. The table below shows the wind-speed range for each EF Rating. The EF-Scale also incorporates 31 “damage indicators” that include everything from the state of trees to houses to office buildings. In other words, these indicators essentially tell you the wind speeds needed to cause varying degrees of damage. For example, a one or two family residence can expect to see some visible damage if winds reach 105 km/h. With 195 km/h winds, such a dwelling would be expected to shift off its foundation while large sections of its roof would be removed. When winds hit 320 km/h, a house like this would be expected to be totally destroyed. In Gatineau, the storm passed through within minutes, knocking out power lines and trapping people in their vehicles and homes. And for some, the storm left them with no homes to return to. Residents of one six story apartment building were evacuated after the winds tore the roof from the building. "There is no more ceiling, no more top on the top of the building where I live," witness Sylvain Cote said. "It was crazy." The storm also appears to have caused a fire at Mont-Bleu Secondary School in Gatineau, with the latest report from CTV Ottawa's Joel Haslam reporting that the school has essentially burnt down. 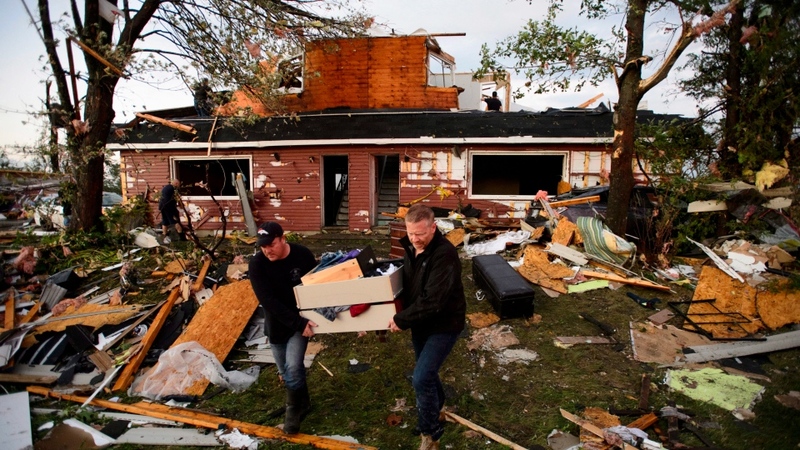 "To everyone dealing with the aftermath of the tornado in Dunrobin, ON & the Ottawa-Gatineau area – stay safe, follow the instructions of first responders and check in with people who might need extra help," Prime Minister Justin Trudeau said on Twitter. "We’re monitoring the situation and thinking of everyone affected." Ottawa Mayor Jim Watson said on Twitter that Ottawa emergency services are going door-to-door in affected areas to check on residents, and offer assistance in getting to a relief shelter opened up at a nearby high school. On Saturday morning, Hydro Ottawa reported that approximately 171,000 customers were still without power as a result of 200 outages across their service area. 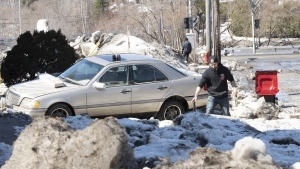 Hydro Quebec said approximately 114,000 residents were in the dark on Saturday and that more than 200 teams were working to restore service to those affected. While the weather agency warned that the situation was “dangerous and potentially life-threatening,” many residents seemed caught off guard by the ferocity of the storm. 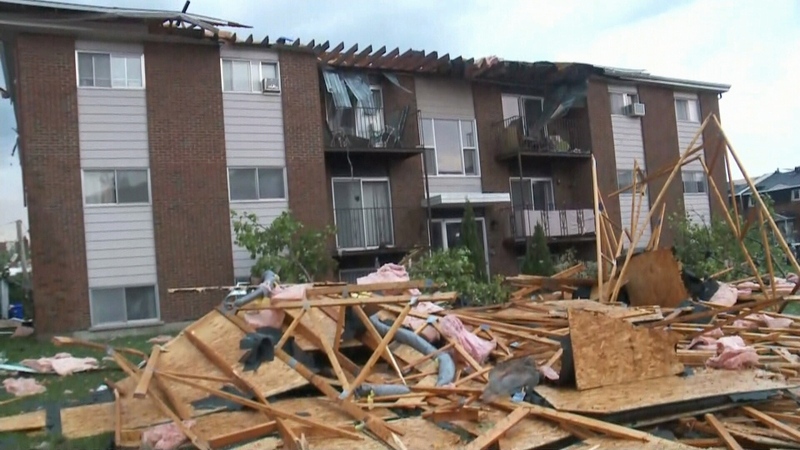 Environment and Climate Change Canada had first issued a tornado warning for the Ottawa region, with subsequent warnings for Prescott and Russell United Counties east of Ottawa as well as the Papineauville - Chénéville area near Upper Gatineau. Warnings are expected to continue into the early evening as a cold front brings near 90 km/h southwesterly wind gusts. 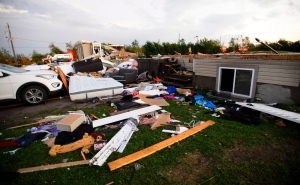 A view of damage caused to a property in the Ottawa area after a tornado hit, Friday, Sept. 21, 2018.